Literature Nobel In Doubt Amid Claims Swedish Princess Was Sexually Harassed : The Two-Way The Swedish Academy was already reeling from sexual assault allegations against a man close to the group, which has been weighing whether to postpone this year's prize. Now, new claims have surfaced. 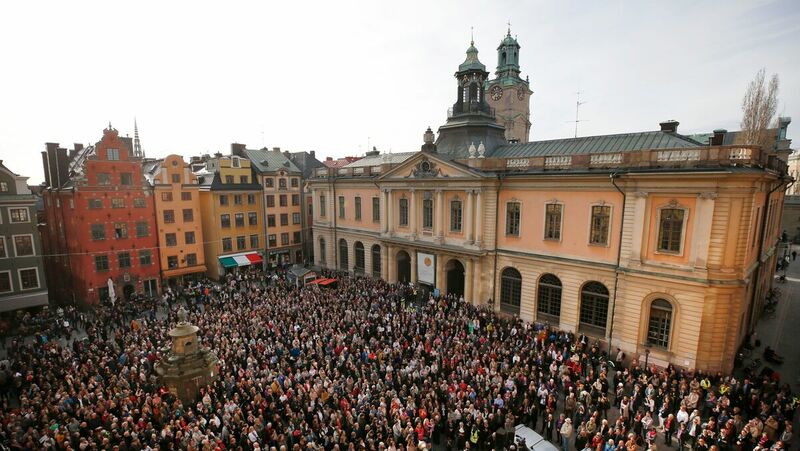 Protesters gathered earlier this month outside Stockholm's Old Stock Exchange building, where the Swedish Academy meets. Demonstrators showed support for resigned Permanent Secretary Sara Danius by wearing her hallmark tied blouse. If the crisis facing the Swedish Academy looked dire earlier this month, this weekend spelled still worse trouble for the 18-member committee responsible for selecting the Nobel Prize in literature each year. Already deeply roiled by sexual assault and harassment allegations against a prominent cultural figure closely linked with the group, the Swedish Academy found that his ledger of alleged victims has added one more very prominent name: Sweden's heir apparent, Crown Princess Victoria. Three witnesses told the Stockholm daily Svenska Dagbladet they had seen photographer Jean-Claude Arnault, an influential cultural impresario in Stockholm, put his hand on Victoria's behind during a 2006 event at an academy-owned property. "He came lurking from behind and I saw his hand land on her neck and go downward. It was all the way down," Swedish writer Ebba Witt-Brattstrom, who had been attending the event, later confirmed to London's The Telegraph. Witt-Brattstrom says a uniformed aide to the princess, who was then 27, "just flew herself" on the then-59-year-old Arnault. "She grabbed him," Witt-Brattstrom added to the Telegraph, "and 'whop', he was gone. The crown princess turned in surprise. I guess she had never been groped. She just looked like 'what?' "
Arnault's attorney has told several media outlets he denies these allegations as well as the incidents of sexual assault and harassment alleged by 18 women in November. His denials have done nothing to ease the turmoil wreaked on the Swedish Academy, of which Arnault's wife, Katarina Frostenson, was a longtime member before resigning earlier this month. Questions about when and what the committee's members knew about the allegations led several other members to resign before her, either in protest or because of the protests — including Permanent Secretary Sara Danius. 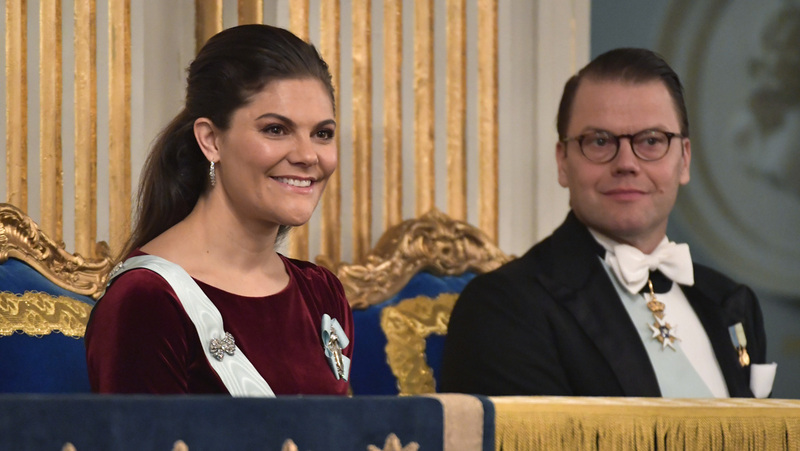 Sweden's Crown Princess Victoria, 40, and her 44-year-old husband, Prince Daniel, attend the Swedish Academy's annual meeting last December in Stockholm. The controversy has even raised the prospect that this year it might be unable to perform its most famous duty, picking literature's Nobel winner in October. The committee discussed the prospect of postponing the award last week "and came to no decision," member Per Wastberg told The Guardian after the meeting last week. He added that members would resume the conversation at another meeting this Thursday, at which point they will very likely reach a decision on whether it will be necessary to skip the prize this year and instead announce two winners in 2019. If indeed the Swedish Academy decides to postpone the award, this would mark the first year since the depths of World War II, from 1940 to 1943, that no writers won the Nobel Prize in literature. Another member, former Permanent Secretary Horace Engdahl, downplayed the possibility to The Guardian — but the committee's public statement last week made little secret of the "state of crisis" it is currently experiencing. "Confidence in the Academy has been undermined, the number of active members is diminished, and there has been an unplanned change in the post of Permanent Secretary," the group acknowledged. It noted that it had already engaged an outside law firm to investigate the situation. The firm has found that the Swedish Academy violated its conflict-of-interest rule by financially supporting a cultural forum co-owned by Arnault and Frostenson and that there had also been "a breach of the Academy's secrecy rules" relating to the Nobel. The Swedish Academy added that another damaging revelation had also recently surfaced: that as far back as 1996, the committee had received a letter detailing an alleged sexual assault at the forum and had ignored it. "The Academy deeply regrets that the letter was shelved and no measures taken to investigate the charges and possibly stop further reimbursements to Kulturplats Forum," the group said. "The Swedish Academy strongly condemns sexual harassment and sexual aggression wherever it occurs." One potential problem for the Swedish Academy does appear on its way to resolution, at least. As we reported earlier this month, the committee's bylaws have had no formal provisions for members to resign their positions, which are supposed to be lifetime commitments. Those same bylaws also demand a quorum of 12 members to make any significant decisions — like, say, changing the provisions on resignation and selecting replacements. All but 11 members have de facto stepped down at this point, leaving the academy in a rather tough bind. But the group's patron, Swedish King Carl XVI Gustaf, stepped in earlier this month with the announcement he is planning changes that will facilitate resignation. "It is a given premise of Swedish and international law that any person who no longer wishes to be a member of an organisation must be allowed to leave," he said in a statement. "This premise should also apply to the Swedish Academy."